Am I The One In the middle of the painting a male child sits in a makeshift boat, (industrial wheelie bin). Another older female child is trying to push to safety. 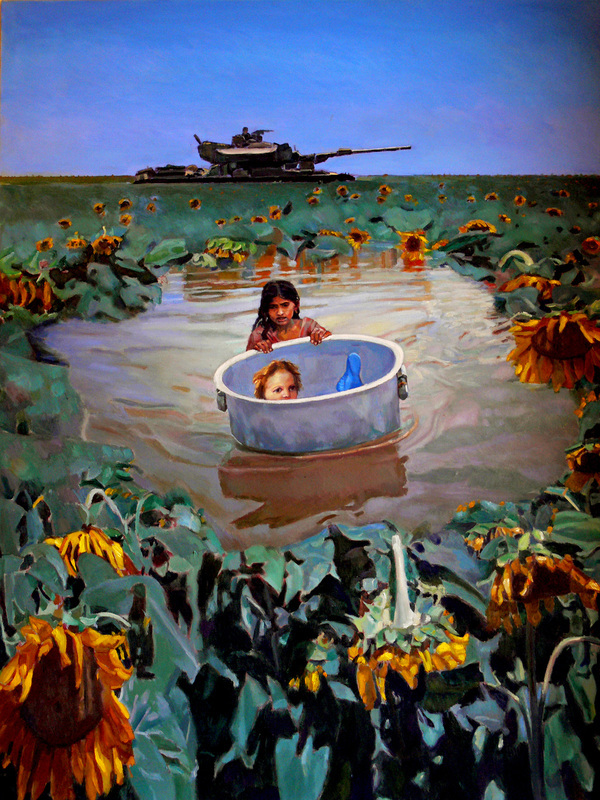 They are in a flooded field of wilting sunflowers with an army tank in the background, which is from a still from Terence Malick’s 1998 Film, Thin Red Line. The little boy is Christ from Raphael’s, Sistine Madonna, 1514. Nahem Shoa's. Animation and mixed media video installation based on his painting. Dimitri Baronheid. Director, Editor, Camera. Self-shot short documentary: Portrait of Nahem Shoa. Nahem Shoa is a leading British artist who paints in oils and acrylics from life marvelous giant images. Shoa has had many solo National and Regional Galleries and Museums shows and has exhibited alongside Lucian Freud, Frank Auerbach, David Bomberg and Robert Lenkowiecz. YOUTUBE: Nahem Shoa paints a 'Giant Head of Ben' and a 'Giant Skull' in profile. Nahem Shoa paints a Giant Human Skull.